With GW releasing new rules for Cultists in the Dec 2017 White Dwarf, my friend and I decided to give them a test run the other day. When I say we decided, I basically derailed our current campaign to give these guys a test run on the board. I'd like to say we followed the rules for them as they're written, but that didn't happen. Before we go any further, here are the cultists rules (PDF download) for those who don't already have them and want to give them a test run in their own games. On the Archives page, there are a handful of additional Space Hulk files that might be helpful too. Finally printing out the rules for myself, I sat down a few minutes before my friend was to arrive for an afternoon of gaming to look over the rules. Coming in at just four pages, one being fluff, another being a new mission meant there were really only two pages of rules. I was kinda excited. 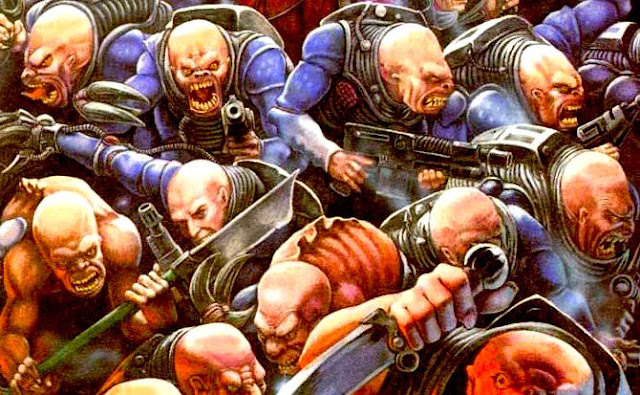 I had visions of these guys being nice and streamlined for Space Hulk and being able to add them to our games with no problem at all. In classic GW fashion, I had far more questions than answers after looking through the two pages of Cultist rules. The first question that comes to mind after glancing through the rules is, "Why even use them in the first place?" A valid question if there ever was one. A glance at their stats and you can see they can't do much if anything to a Terminator in close combat and can't hit anything with gunfire. What's the point then? It's tough to answer that. I suspect it falls in line with why we pick the Space Marine chapter we do or the weapon loadouts we do. This might come down to personal preference and game flavor. For the sake of discussion, let's just say you decide to use them like we did and you go all out. How many different "Cultists" or "hybrids" do we really need? The first thing you discover is there are four different types of "hybrids." Why? Well I know why... it's because we have all the new "fancy" models for 40k. But it's too much for Space Hulk. The folks who play Space Hulk look for the simplicity and enjoy speed at which the game plays. Four types of "hybrids" all with different stats does nothing but add confusion and headache. Make them a "hybrid" or a Purestrain. No more distinction need be made. Before we started, we'd simplified ours into one "type" of hybrid. The only distinction being how they are armed. Our hybrid can be equipped with a close combat weapon and pistol, a rifle or a heavy weapon. That's it. On to the next problem. Which brings me to movement. I get it, They're not really Purestrains and not really human so technically they should have slightly different movement stats once converted (blips still move the same). Again, how many movement stats do we need to have? Are they really that different from a Purestrain... just make them move with all the same characteristics and keep it simple. It's what we did. That way, nothing new needs to be memorized or remembered each time you want to break these guys out for some variety in your missions. There are some things we found missing right off the bat. Things that could have been fixed with a simple line or two in the rules for clarification. And that's what bothers me the most, these issues should not have come up in the first place. Overwatch. Can hybrids go on Overwatch or not? The only thing that comes close to covering this is a sentence that says, "Their shooting is resolved in exactly the same way as for a Space Marine," which seems to me that they can. We gave them the ability to do it for consistency across the board, but did not give them the benefit of Sustained Fire. We figure they aren't the best shots when it comes down to it. The same applies to going on Guard. No mention either way. We figured they can do that as well. Can they shoot doors? More importantly, will their shooting destroy the door? We decided they could, but only the heavy weapon guys would actually be able to destroy one. As my friend so eloquently put it, if they (a heavy weapon equipped hybrid) can take down a Terminator, they can certain take down a door. Case closed. We wondered if they should die to being caught in a Heavy Flamer blast easier than a Purestrain. If a Purestrain only survives on a 2+, then really what are the chances a human is going to make it? Far less. But for the sake of consistency, we gave them the same survivability as a Purestrain. Neither of us wants to have to remember a hundred different stats for a every variation of hybrid caught in flamer blast. If it's a bug, it dies on a 2+. All that being figured out, we opted to give the Marines a slight buff when shooting at Cultists. There's an old second edition rule known as Firestorm if memory serves me correct. It was something that applied to an Assault Cannon that allowed to you to kill more than one enemy at at time with a single burst. Really gives the Assault Cannon the right feeling in the game. We use this in our games now and we decided to give this ability to Storm Bolter equipped Marines as well when shooting at hybrids. So what's the good then? I will say that I like the mechanism for how they are revealed. It's simple and easy to implement. The biggest thing we discovered is the increased tension in the game. The Space Marine player immediate becomes aware of fire lanes and no longer hangs out in exposed corridor intersections possibly exposed to gunfire. Adding hybrids with the ability to shoot does increase the tactical decisions for the Marine player. He has a host of new things to consider. The Genestealer player has a slight increase in flexibility too. Being able to choose between Purestrain or hybrid means they can pick the best enemy for a given situation. We haven't tried out the Magus or Patriarch yet. We will in the next couple weeks when we get back together again. This time we wanted to run the Cultists through and see how they performed. GW says you can include these guys in any of your games. Given the changes my friend and I have made to our hybrids, this seems completely doable for us without having to make any other changes to the mission profile. We are looking at giving Purestrains the option to move past hybrids in hallways. We haven't given them the ability yet, but it's something we'll most likely implement in the next game as it adds an increased tactical edge for the Genestealer player. And one final consideration, if you make these changes that we did, you need to think about how you're going to account for the additional time required to resolve the effects during the Marine player's turn. These additional actions will quickly eat into your limited time. It's something to keep in mind. 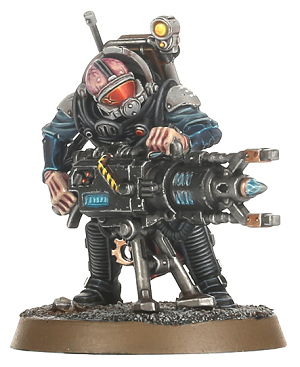 As the Genestealer player, I like what hybrids bring to the game. The slight increase in flexibility, the added shooting capability and the additional stress placed on the Marine player makes for a fun game. As the Marine player, I welcome the challenge. If you use the new hybrids in your games, let me know. I'd be interested in hearing how they work for you and what if any changes you've decided to make to them. IMAGE: Games Workshop, The original hybrids and one of the new Cultist models.